So, I’ve been pretty disenchanted with CD‘s lately, and I’m certainly not paying money for compressed tracks. Where does that leave me? Vinyl. Records have been making a comeback recently, with more units shipped in 2008 than any year since 1998. If you like dance music, electronic music, hard to find or indie music, or really any music at all then VinylSearcher.com has you covered. I must say, it took a lot of searching for individual albums before I finally found them, but man it was worth it. They’ve got everything from used $3 EP’s to mint condition $2,300 4 Disc LP’s. They’ve got the rarest of the rare as well as the option to pre-order new releases. Oh, and they’ve got CD’s too. Their trick is that they aggregate the collections of around 30 different vinyl retailers to give you as many results as possible for each album. Now, I haven’t yet purchased from them (its 10 bucks for airmail to the US by the way) but I’m planning on it. Just as soon as I have 2,300 bucks to burn on that mint condish Aphex Twin LP. 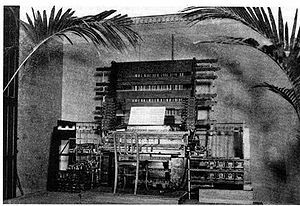 Pic: 1897 Telharmonium. Know your roots.